January 28, 2016 – New data from NASA’s New Horizons spacecraft point to more prevalent water ice on Pluto’s surface than previously thought. This false-color image, derived from observations in infrared light by the Ralph/Linear Etalon Imaging Spectral Array (LEISA) instrument, shows where the spectral features of water ice are abundant on Pluto’s surface. It is based on two LEISA scans of Pluto obtained on July 14, 2015, from a range of about 67,000 miles (108,000 kilometers). The scans, taken about 15 minutes apart, were stitched into a combined multispectral Pluto “data cube” covering the full hemisphere visible to New Horizons as it flew past Pluto. A data cube like this is a three-dimensional array in which an image of Pluto is formed at each LEISA-sensitive wavelength. Water ice is Pluto’s crustal “bedrock,” the canvas on which its more volatile ices paint their seasonally changing patterns. 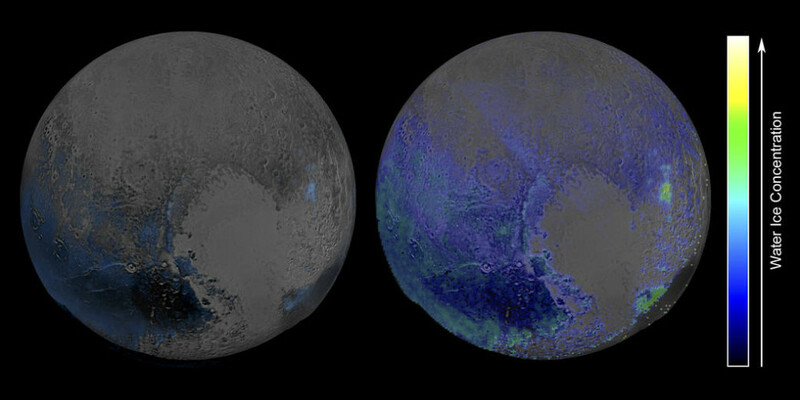 Initial New Horizons maps of Pluto’s water ice bedrock compared LEISA spectra with a pure water ice template spectrum, resulting in the map at left. A disadvantage of that technique is that water ice’s spectral signature is easily masked by methane ice, so that map was only sensitive to areas that were especially rich in water ice and/or depleted in methane. The much more sensitive method used on the right involves modeling the contributions of Pluto’s various ices all together. This method, too, has limitations in that it can only map ices included in the model, but the team is continually adding more data and improving the model.